“Let me begin by saying that regardless of economic predictions that shift with the wind, my promise to create 700,000 jobs over seven years has not and will not change. 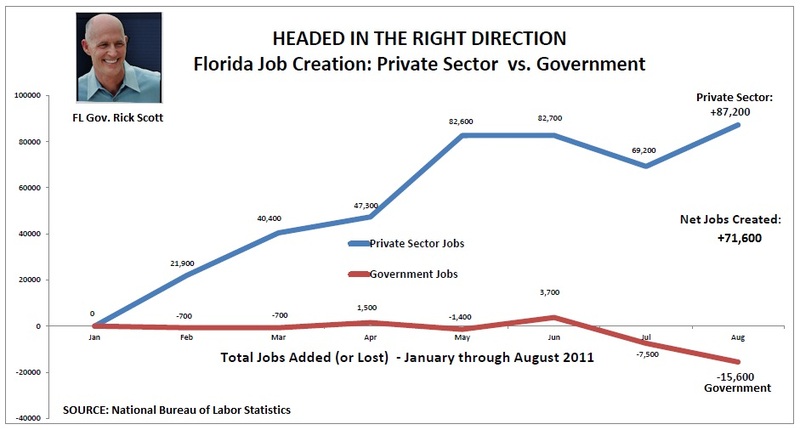 “During my campaign for Governor last year, I unveiled a plan to fix Florida’s economy and turn the state around. It was called the 7-7-7 Plan: Seven Steps to 700,000 Jobs in Seven Years. As I said during my campaign, this plan will create 700,000 jobs over seven years no matter what the economy might otherwise gain or lose. “No one, not even economists, can predict the future. What can be verified is actual job creation data. From July to December 2010, before I was in office, Florida’s job creation numbers show that the state had a net loss of 20,100 jobs. For 2.5 years before that the state lost 878,100 jobs and the unemployment rate skyrocketed from 3.5 to 12 percent. “Since then, we have begun implementing the 7-7-7 plan and creating an environment where jobs can grow. Sure enough, Florida has gained 87,200 private sector jobs so far this year and the unemployment rate has started going down, bucking the trend at the national level.